The most important territorial gain acquired by the Japanese by the power of the treaty signed at Shimonoseki was the island of Taiwan. 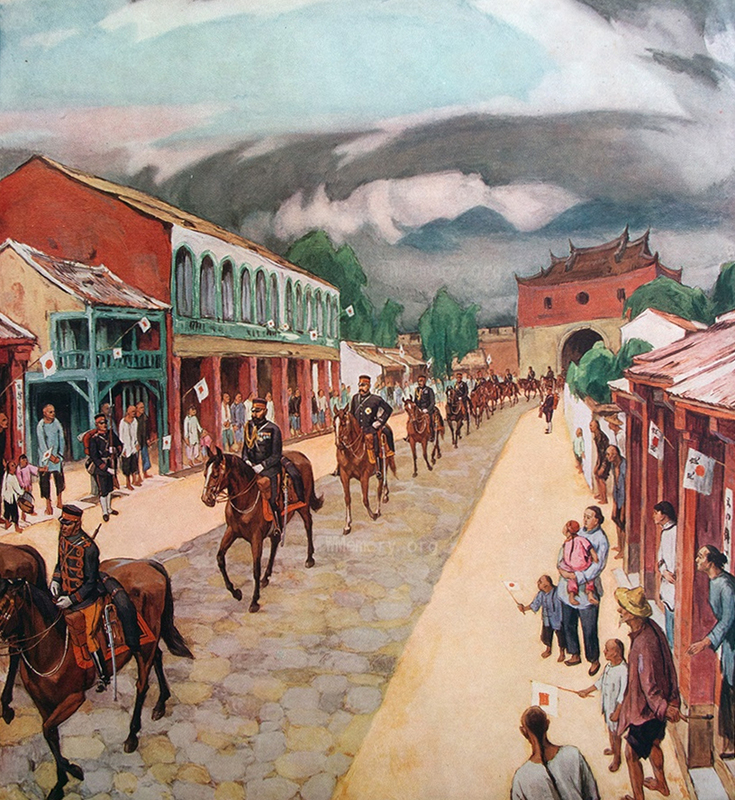 The moment it was signed and later ratified at Chefoo, the power was still exercised by the Ch’ing administration, while the Chinese garrisons were stationed in the towns of Taiwan. In that situation the condition of the Treaty of Shimonoseki caused outrage of the native population, which on May 23, 1895, forced the local authorities to declare independence of the island. Tang Ching-sung, the former Chinese Governor of Taiwan, became the President of the self-proclaimed state, while the capable and distinguished General Lu Yungfu, veteran of the war with France, became the commander-in-chief of the military forces. Preparations to repulse the inevitable Japanese invasion became a matter of the utmost importance for the authorities. However, it soon turned out that this task exceeded the capabilities of the island’s administration, which was led by the old Ch’ing dignitaries, who had no faith in victory and devoted all their energy to ensure a safe escape route to China for themselves, their families and possessions. The officers and a majority of regular army troops were of the same attitude, and therefore two `Black Flag Army’ battalions redeployed to the island in January 1895, along with Lu Yungfu, soon became the only real military force in Taiwan. Admittedly, the formation soon grew in strength to around 12,000 troops. These were, in the main, enthusiastic but poorly trained and armed, and realistically unable to face the Japanese army in an open combat. The Japanese invasion of Taiwan began at the end of May. Taking into account the likely resistance of the Chinese population, they thoroughly prepared, assigning the select 1 st Imperial Guards Brigade under command of General Prince Kitashirakawa to the task. Naval support would be provided by the cruisers Yoshino, Matsushima, Chiyoda, Naniwa, Takachiho and Sai Yen (the ex-Chinese Chi Yuan, captured at Weihaiwei). The Imperial Guards were embarked on 16 transports. Vice-Admiral Arichi Shinanojo, promoted to a higher post in Vice-Admiral Ito’s General Staff, became the commander of the entire armada. He flew his flag on board the cruiser Yoshino. Rear Admiral Togo, commander of the cruiser Naniwa, became his second in command. One of the transports held Vice- Admiral Kabayama, appointed to the post of a military governor of the island. On 25 May, after three days of steaming, the leading cruisers, Naniwa and Takachiho, arrived at the mouth of the Tamsui River. They were soon joined by the remaining Japanese forces. 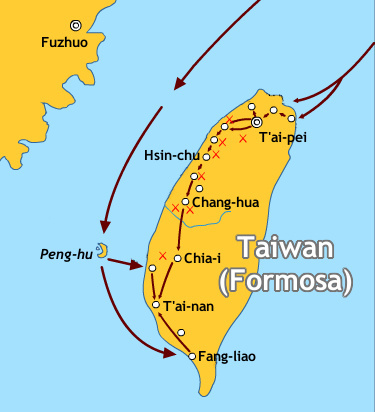 The primary objective of the invasion force in the initial stage of the Taiwanese campaign was the capture of the island’s capital town of Taipei. On the following day, in order to find a suitable area for the landing of the Imperial Guards, Rear Admiral Togo took the Naniwa and the Matushima towards the harbour of Keelung. Near Cape Santiaochiao, 55 km from Keelung, he spotted a beach which was suitable for the landing. Togo’s plan was accepted by Arichi and Kabayama and on 1 June, over 6,000 Japanese troops landed unopposed at Santiaochiao. They immediately double-marched towards Keelung, arriving there the following evening. The cruisers Naniwa and Matsushima had been providing cover for the landing at Santiaochiao, after which they arrived at Keelung at around the same time as the troops. On 2 June, they were joined by the Takachiho and the Yoshino. In the early morning of 3 June, the Japanese attacked the Chinese positions around Keelung. This was preceded by a naval bombardment of the harbour and the coastal fortifications by the Japanese cruisers, which, taking advantage of the darkness, approached to 16 cables (2.9 km) from the shore. Soon thereafter the Imperial Guards attacked, quickly taking the key positions of the Chinese defence. By the evening both the town and the harbour were in Japanese hands. The self-proclaimed president Tang, who remained in the town during the assault, managed to escape at the last moment on board a German steamer along with a group of his closest associates. Following the capture of Keelung, Taipei became the next objective for the Japanese troops. On 4 June, the Imperial Guards departed for the town while the Japanese cruiser Naniwa and Takachiho arrived at the mouth of the Tamsui River on 7 June, establishing a naval blockade of the capital. The escape of the president and high-ranking Taiwanese dignitaries so disorganised the defenders that Taipei was captured by the Japanese almost without a fight. On 17 June, after pacifying the remains of the Chinese resistance, the new Japanese Governor of the island, Vice-Admiral Kabayama arrived at the capital of Taiwan. Slightly earler, the Chinese delegation, which had accompanied the invasion force from the start, officially handed over power to the Japanese. This was agreed on board the transport Yokohama Maru, anchored in the Keelung roadstead. The formal takeover of the island by the Japanese administration did not put an end to the ongoing military operation in Taiwan, despite the escape of the civilian authorities of the self-proclaimed republic and the capture of the northern part of the island by the Japanese. The `Black Flag Army’, supported by some regular troops and local people, put up an unexpectedly strong resistance in the south and in the centre. Therefore, the Japanese land troops took the main burden of the military operations. They slowly advanced south, engaging in heavy fights with the Chinese. The offensive was hindered by difficult terrain and climatic conditions, as well as by equipment inappropriate for the hot tropical climate. Combat losses and epidemics of malaria and dysentery soon decimated the forces of the 1 st Imperial Guards Brigade and forced the Japanese command to reinforce the island. In October 1895, the infantry regiment from the Pescadores arrived, followed in January 1896 by the infantry regiment from the 7 th Brigade of the 4 th Division. The Japanese navy forces stationed in Taiwanese waters were also reinforced. At the beginning of June 1895, they were joined by the cruiser Akitsushima, which arrived from Japan. Both she and the remaining warships mainly conducted reconnaissance missions for the army, repeatedly shelling coastal towns controlled by the enemy and often sending small landing parties to pacify pockets of the Chinese resistance. The final large operation undertaken by the Japanese navy in the Taiwanese waters took place from 15 October 1895, when the cruisers Yoshino, Naniwa, Akitsushima and Sai Yen bombarded Takao, preceding its later capture by the landing troops. On 21 October, the same warships shelled Anping, which was also soon captured by the Japanese landing force. In the later period, the activities of the Japanese warships around Taiwan were limited to patrolling and providing occasional artillery support to the fighting troops (usually by single warships). At the end of October, Vice-Admiral Arichi was called back to Japan, followed by Rear Admiral Togo in the middle of November. Due to the fact that the military operations had moved deep inland, the majority of warships stationed in the Taiwanese waters were also called back to the home country. Fighting on land continued for some time. Defeated Taiwanese insurgent troops, taking advantage of the support provided by the native population, turned to guerrilla warfare. Finally, by the end of 1896, the island had been pacified. The Japanese losses in Taiwan were quite substantial. In combat with the insurgents the army lost a total of about 700 killed or wounded. Significant losses were also caused by various epidemics which broke out repeatedly among the fighting troops. It was estimated that a total of almost 20,000 Japanese troops and workers brought to the island either died or were hospitalised due to those causes. The losses suffered by the Japanese navy were less significant by comparison, mainly limited to loss of torpedo boat 16, which sank with all hands in a storm near the Pescadores on 11 May, 1895. This entry was posted in China, Japan by MSW. Bookmark the permalink.